With the boys on their way to the church and with the girls' hair and make-up done, there was only one thing left for me to do. It was time to get the dress on. The girls had already changed into their beautiful grey bridesmaid dresses while my hair was being finished off. They looked stunning, seriously. I snuck into the bathroom to get my sassy sucky-inny-undergarments on. 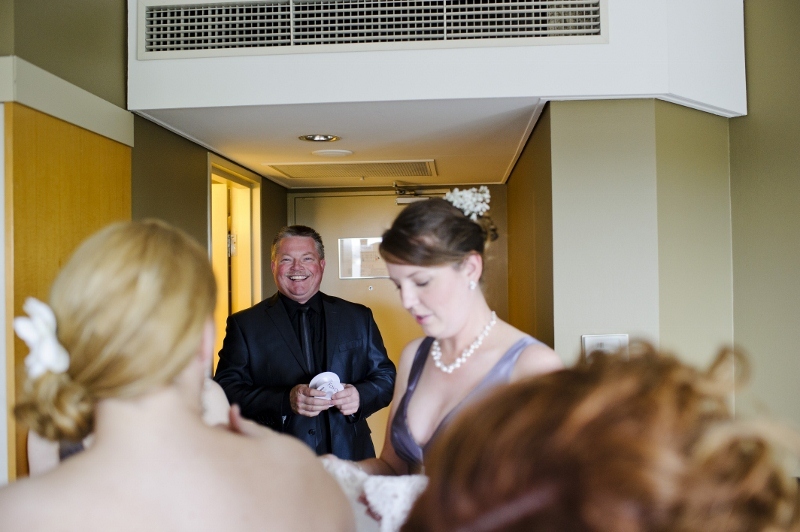 When I returned, it was just my mum and my girls waiting in the room, ready to help me slide into my wedding gown. 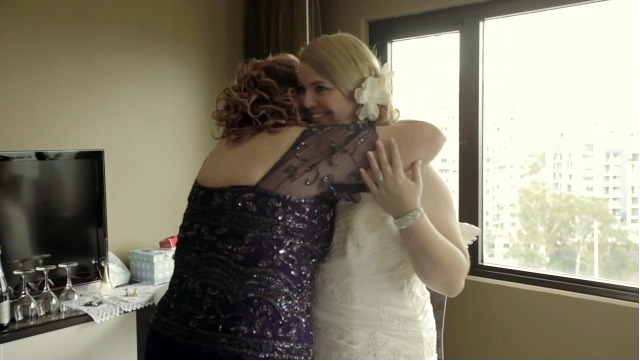 As soon as she saw me, my mum took it upon herself to get teary and come give me a hug. I not-so-gently replied to her cuddle with a 'GET OFF THE DRESS' outburst, which caused us to get the giggles while I attempted to keep the unbuttoned dress from falling off. It was time to do me up, buttercup. I was so, so nervous about the dress fitting me. I've never sucked in my guts as much or held in my breath for as long as I did during those few minutes. 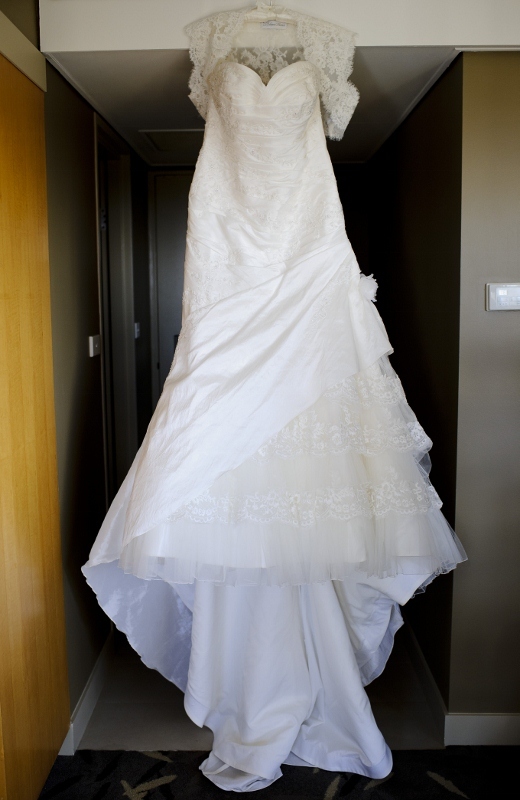 As soon as I knew the dress was going to zip up and close after all, I relaxed. 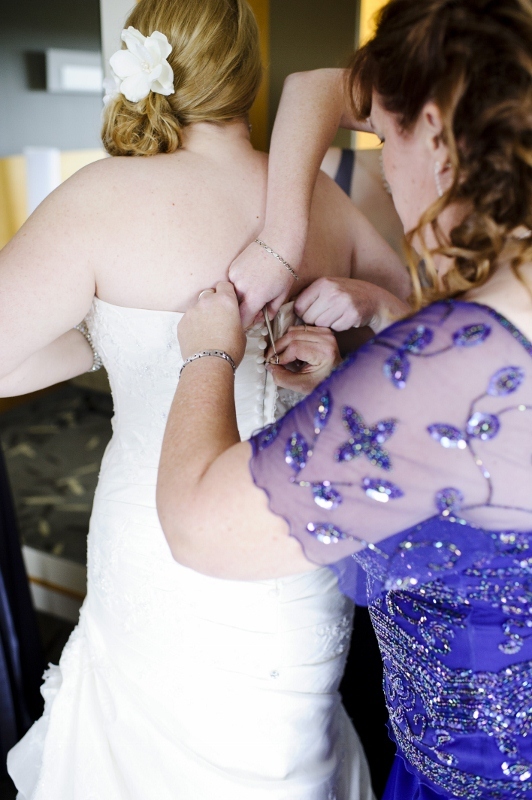 We borrowed an old silver button-hook from my grandmother to help us with the tiny buttons down the back of the gown. My dad hadn't seen the dress before - I loved seeing his reaction for the first time. 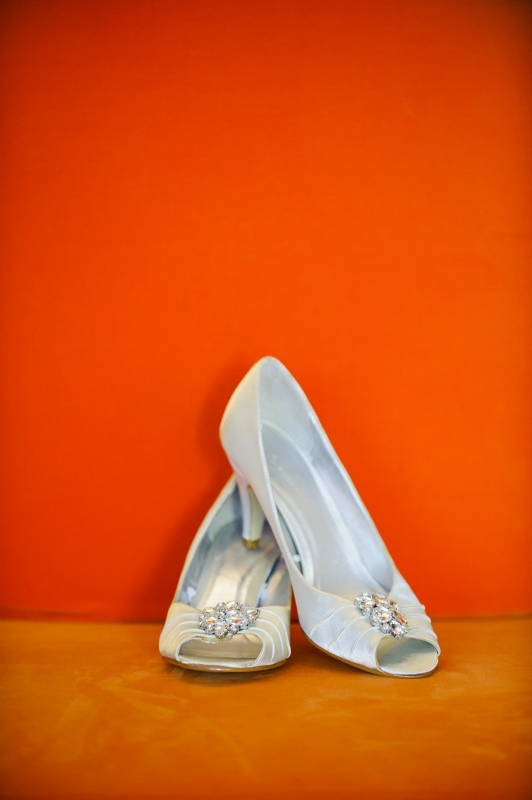 After all of my indecisiveness, I decided on just one pair of wedding day shoes after all - the ivory ones! My Maid of Honour helped me into them while I hoisted the lower layers of my dress up out of the way. 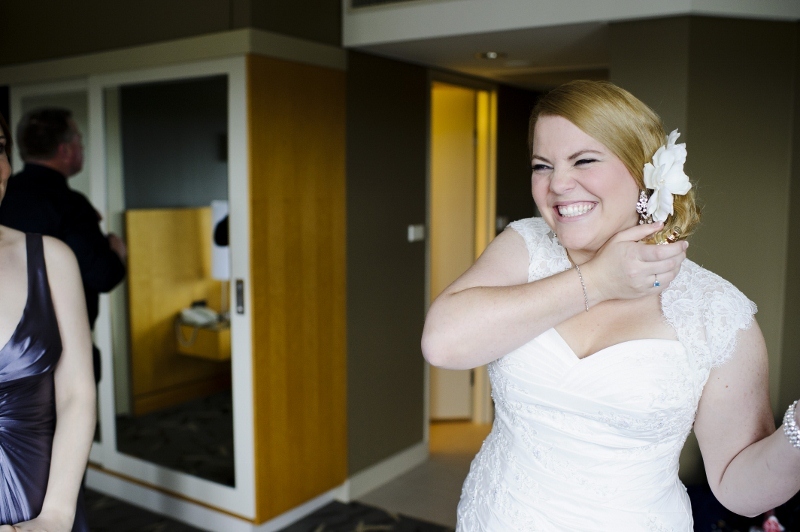 A little wedding day perfume was sprayed on - not without more face pulling, of course. 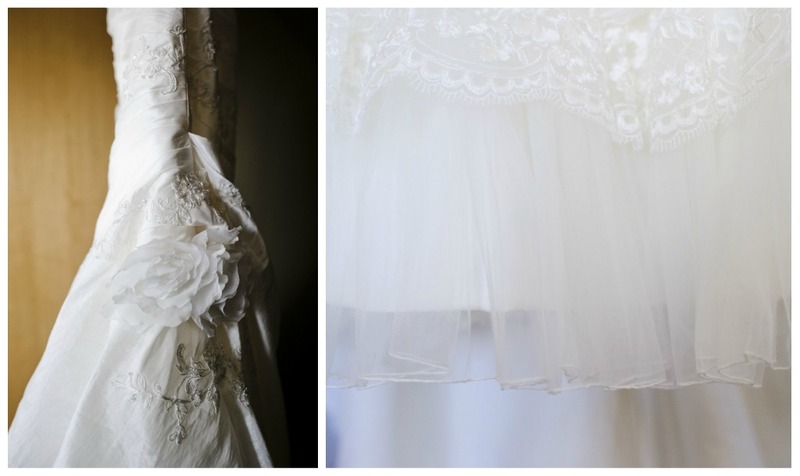 I chose j'adore: it's feminine, light and will forever remind me of our wedding day. We were just about ready to walk out the door, but wait... what about the gorgeous veil I had borrowed from Mrs. French Fries to wear for the ceremony? Well, in the heat of the moment, I completely forgot about it. As in, hadn't even given it one single thought. And.. uh oh, our make-up and hair stylists had already left - with all the hair pins. Yikes! The girls improvised to get it wedged into my hair style, MacGuyvering it up with pins from their own hairstyles to keep it firmly in place. With the veil wedged in as good as we were going to get it, it was really time to go! SO beautiful. LOVE the lace bolero. I still love the dress every time I see it. Great decision. Stunning bride! Beautiful. You were completely stunning. I, however, look terrified or 'special' in every photo I've seen. You are so beautiful! Absolutely stunning - seriously! And the lace bolero? A wonderful touch. i seriously cannot get over how amazing you look and how fabulous your dress and that bolero are. i LOVE it. I LOVED your dress and bolero - seriously, so gorgeous. 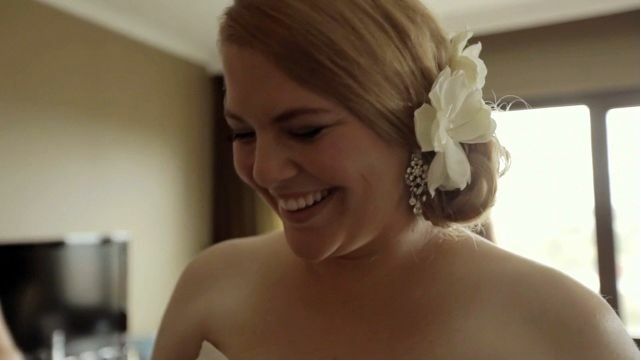 And you are the most stunning bride ever! !